Meet Nigeria's Enterprising Dwarf Actors A group of dwarves are running around the streets of Lagos, Port Harcourt and Asaba, selling films they acted in. That's what we call entrepreneurship. the film Jetfighter, are fixtures in the Nigerian film industry. Verne Troyer, Peter Dinklage and Jordan Prentice are fairly popular Hollywood actors. They have money, influence and fame. But there is one thing that distinguishes these actors from their peers—they are dwarves. Dwarves have always been an integral part of the movie industry worldwide. In Nigeria, there have been dwarf actors like the popular Ik_eregbe from the 80s hit TV show, New Masquerade. 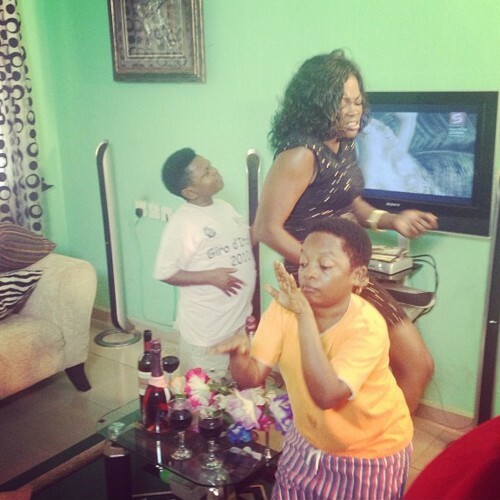 Today's diminutive acting stars include Osita Iheme and Chinedu Ikedieze, better known as Aki and Pawpaw, who together have featured in scores of Nollywood films. There is also another group of dwarf actors in the Nigerian film industry. Inspite of the glitz that comes with being in movies, these actors are not popular for their acting prowess but for being on the streets selling their works. You will see them on major streets of Lagos, Port Hacourt, Asaba and many other cities across the country. They approach your car and put up a video CD for you to see. They expect you to recognise their face from the cover of the CD. “Oga buy my film. Na me act am. Shey you no recognise me? I don act plenty film,” they'll usually say in pidgin with the intent of getting you to buy their films. If you buy one of these films, you will find that they, like other Nollywood movies, are low budget productions. But if ‘small people’ humour is your thing, you might find them quite interesting. Their plots are often similar, all the actors are dwarves and if there is a person of normal height on the cast, that person will most likely be an object of ridicule in the story. Dwarf movies are usually shot in Lagos or Asaba by the Nollywood Dwarves Association (NDA). Unfortunately, this association is not formally registered and does not have any ties to the Actors Guild of Nigeria(AGN). In fact, dwarf actors in the NDA never get roles in mainstream films. They get no recognitions, no awards, no concessions, no formal training in movie making, nothing. What they have created is a mere cottage industry which keeps their members employed. After production, the films do not go to the mainstream marketers in Alaba, Idumota or Aba. Instead, they are distributed among members of the association who hit the streets to sell them directly to the public. The proceeds are later divided among those who helped to make the films. Monsurat Balogun, a marketer in Idumota, pities the dwarf actors. But even more, she admires their enterprise. “I respect those people. They do not get money from anyone to make their films. They record it themselves, edit it with their money, package it with their money, and they will still sell it themselves. I really respect them,” said Monsura. So why does she not market their films? “You know that their films are not like other films. They are the only ones in their film and sometimes they do not record it very well. I am not saying that their film is not good, but you know our business depends on quick sale, and their films are not like the normal films and might take time to sell,” she said. What these dwarf actors need more that anything at the moment is proper training. They also need to look more into incorporating themselves into mainstream movies just like Aki and Pawpaw. Many people when asked, said they would not watch a film that has only dwarves as actors. James accepts that he lacks proper training in film making and he plans to go to a film school in the future, but for now, he continues to prowl the streets of Lagos trying to sell his ‘masterpiece’.